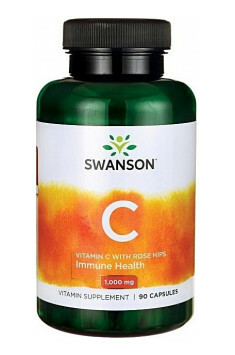 Swanson Vitamin C with Rose Hips is a dietary supplement with vitamin C (ascorbic acid) in both efficient and safe dosage – 1000mg (1g) in one capsule. In addition, the effect of vitamin C is supported by the extract from rose hips, which, on the one hand, prolongs and strengthens the effect of vitamin C and, on the other hand, is a natural source of vitamin C in itself. Vitamin C (ascorbic acid) – an essential dietary component which conditions normal functioning of the organism, and which needs to be delivered with food, as human beings cannot synthesise it. It is an important antioxidant, which means that it enables a stable antioxidant potential in a cell, as well as takes part in transporting electrons between molecules. Dog-rose (extract from rose hips) – contains a great amount of natural vitamin C, which is much more effective than the synthetically produced ascorbic acid. That is because it occurs among many other bioactive components which facilitate its absorption and prolong its effect on the organism. The components which belong to that group are: vitamins A, B1, B2, E, K, bioflavonoids (including rutin), folic acid, organic acids, tannins and pectin. Although the recommended dietary allowance (RDA) of vitamin C is 80mg for women and 90mg for men, remember that these dosages are the minimum value needed to prevent scurvy. The vitamin’s healing properties are much higher. For example, it was not taken into account that the vitamin C level drops drastically in times of emotional or physical stress. Every inflammation, surgery, bacterial infection or poisoning requires larger dosage of vitamin C.
Reportedly, athletes, physically active people, smokers and those with digestive problems have a higher demand for vitamin C. Obviously, people with insulin problems and hypoglycaemia should definitely start supplementation, as a high level of glucose in the blood makes the absorption and effect of vitamin C weaker and increases the amount of it in urine. Vitamin C deficiency leads to catastrophic effects on health, including scurvy – a multi-organ disease whose main symptom is connective tissue deterioration. That is because vitamin C is a coenzyme in creating the pre-pro-collagen. Its deficiency and a disturbed process of collagen synthesis (scurvy) leads to spontaneous bleeding (blood vessel damage), muscle, joint and bone pains, pathological fractures, gingivitis and tooth loss. Unfortunately, there is less and less vitamin C to obtain from food. That is because the compound is one of the most sensitive ones to external factors. High temperature, exposure to light and direct contact with air destroy vitamin C in food. Moreover, analyses of fruit composition confirm that there is less and less natural vitamin C in them each year. The biggest amount of vitamin C can be found in the Malpighia glabra fruit and in dog-rose. Parsley, blackcurrant and red pepper are good sources as well. Research has shown that vitamin C supplementation significantly reduces the duration of colds and infections. It is particularly effective in athletes and people who spend most of their time in low temperatures (thus, exposed to additional stress), in whom the frequency of cold occurrence was reduced by over a half (50%) after using 2g of ascorbic acid daily. A feature of vitamin C that is not very well known is its ability to remove heavy metals from the organism. However, that only happens when its amount exceeds the minimum needed to cover all the basic functions in the organism. In that case, vitamin C is able to remove, among other things, lead, mercury, arsenic, cadmium and nickel. It is recommended to use prebiotics during treatment in order to prevent reabsorption of the toxins in the colon. There is a lot of controversy related to using vitamin C in cancer treatment. There is also an ongoing conflict between specifically academic medicine (strongly supported by the pharmaceutical industry) and alternative therapies. One thing is undeniable – there is quite a big amount of evidence suggesting that introducing vitamin C to cancer treatment is beneficial in numerous ways. Many practitioners have reported that vitamin C has prolonged the lives of terminally ill patients, as well as inhibited the development of skin cancer cells, destroyed breast cancer cells thanks to the factor stimulating apoptosis, improved the general feeling of patients and alleviated chronic pain. Meta-analyses conducted by researchers also confirmed the relationship between taking vitamin C and decreased colon cancer incidence, and, above all, improving the survival rate of already ill patients with cancer. Researchers have found out that administering high doses of vitamin C (1-1.5g per day) results in significant decrease in cortisol level (stress hormone) in the organism. It is particularly relevant for athletes and dieting people, as cortisol is, on the one hand, a catabolic hormone (it inhibits building muscles), and, on the other hand, its permanently high level leads to metabolic disorders, including the accumulation of body fat. To sum up, Swanson Vitamin C with Rose Hips is a dietary supplement which should be commonly used within health prevention programmes, as it supplements many diet-based deficiencies. It is particularly recommended for athletes and people under chronic stress because, as shown by some reports, they need much more vitamin C than a regular healthy person. Vitamin C with Rose Hips 1000mg 90 caps. 1-2 capsules a day depending on the physical activity level and the state of the organism (during disease it is recommended to take higher amounts of vitamin C at even time intervals). Vitamin C is soluble in water, therefore it is so important to wash down the capsules with plenty of water. Additionally, its assimilability will be increased when applied with natural vitamin C carriers. The recommended daily use of this vitamin should range from 100 to 200 mg and it is usually provided with a diet. In case of diseases or infections we need to support our immune system and take higher doses – it has been proven that the dose of 2 g/day (4 capsules) may decrease the symptoms of the cold or shorten its duration. However, in case of general health prophylaxis, using 1-2 capsules a day is enough. Capsule (gelatin), Anti-caking agent (magnesium salts of fatty acids, silicon dioxide).